Junior Minister in the Ministry of Communications, Works, Public Utilities, Post, Physical Planning, Natural Resources and Environment the Honourable Carlisle Powell. The bold statement, made on May 11 in the presence of employees from the Caribbean Development Bank [CDB] as well as NIA civil servants, came as Junior Minister in the Ministry Works, the Honourable Carlisle Powell spoke at the launch workshop of the Nevis Water Supply Enhancement Project. In addition to highlighting the benefits of the project, Minister Powell expounded on the island’s advancement with regard to water. “Up until 2006, people on the outskirts of Charlestown, in the village of Hamilton, went for weeks without running water,” he explained. Minister Powell also used the opportunity to comment on recent water systems upgrade work at the Golden Rock Hotel and at Gore Hill in Fountain Village. Other developments executed by the Ministry of Works and the NWD, as highlighted by Minister Powell, were the provision of more than 400 million gallons of water from the island’s wells and with the assistance of Bedrock Exploration And Development [BEAD]; Nevis’ ability to “enjoy a good supply of water 24 hours a day, seven days a week” despite water shortages in other Caribbean islands; and the recent hire of a new lab analyst for the NWD. “In addition, even though the Four Seasons Resort was closed, we supplied them with a total of 38l, 480,000 gallons of water from our trench well at an average of 3,206,666 gallons per month,” he explained. 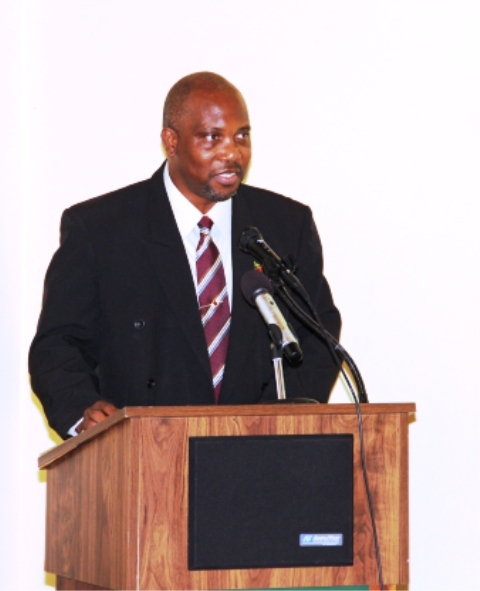 Minister Powell’s remarks ended as he recorded his support of the Nevis Water Supply Enhancement Project.